LEXINGTON, Ky. (April 25, 2016) – The Breeders’ Cup, one of Thoroughbred horseracing’s most prestigious international events, has today announced that it will return to Churchill Downs in Louisville, Kentucky in 2018. As part of the company’s ongoing strategy to maintain a three- year out host site plan, Breeders’ Cup will work closely with Churchill Downs and the local Louisville community to drive excitement and anticipation for the event over the next few years. One of the world’s most iconic and recognized tracks, Churchill Downs last hosted the Breeders’ Cup World Championships in 2011. The return to Louisville reflects the Breeders’ Cup commitment to bring the event to the country’s best racetracks and to combine the sport’s best racing with best-in-class dining, hospitality and entertainment. 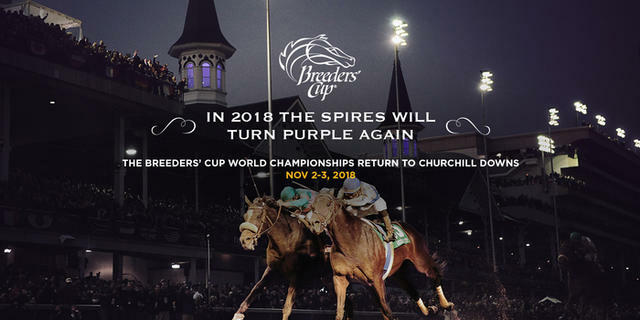 The 35th Breeders’ Cup World Championships will be held on Friday, November 2 and Saturday, November 3, 2018 and televised live by NBC Sports Group. Since 2011, Churchill Downs has invested more than $67 million in the facility to further elevate the experience for all fans and participants, while also introducing new, in-demand luxury seating and entertainment options. The improvements include Clubhouse enhancements, Winner’s Circle Suites, Grandstand Terrace & Rooftop Garden, The Mansion and the installation of the world’s largest 4,000 Ultra High Definition Big Board. The 2018 Breeders’ Cup World Championships will be the ninth time that the event will be hosted at Churchill Downs which, at that time, will be tied with Santa Anita Park in California for the most ever held at one venue. In years past, largely in part to the incredible support of the Louisville community and Kentucky residents, Churchill Downs has hosted the largest Breeders’ Cup’s crowds, including a record-breaking two-day attendance figure of 114,353 in 2010, which also set a two-day on-track handle record of $22,515,318 and a total two-day handle record of $173,857,697. In 2018 these numbers have the potential to reach all-time highs as interest in the Breeders’ Cup continues to grow.